The Internet of Things (IoT) is expected to drive the next technological revolution that will change how we live and work. IoT will enable billions of devices with intelligent sensors and machine learning capabilities that will communicate, sense, and interact with internal or external systems, all without human intervention. To reach to this potential, the industry standards group known as 3rd Generation Partnership Project, or 3GPP, started working on standardization of the requirements for new cellular-based narrowband technology targeted for the Internet of Things. The first version of the NB-IoT standard was released in June 2016, as a part of Release 13 of the global 3GPP standard and is based on existing LTE technology already deployed in 4G networks worldwide today. And while NB-IoT signals may operate under any of the three different implementation modes described above, the most common at this early stage of the technology is the so-called In-band mode that has already been implemented by large service providers in Europe like Vodafone, Deutsche Telekom, Telecom Italia Mobile, etc. with many other wireless operators worldwide following in their footsteps. These operators need to ensure that existing LTE networks and new NB-IoT services coexist in harmony, while maintaining the required quality of experience and service level agreements expected for each. 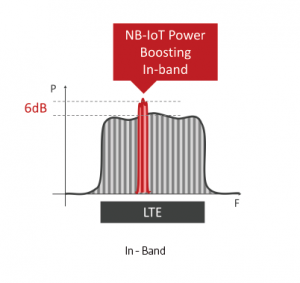 The main advantage of NB-IoT In-Band mode is that is the most cost-effective and seamless for mobile operators to implement since it does not require any hardware changes to the radio access network, and efficiently uses spectrum resources for LTE or NB-IoT services based on demand from mobile users or devices. 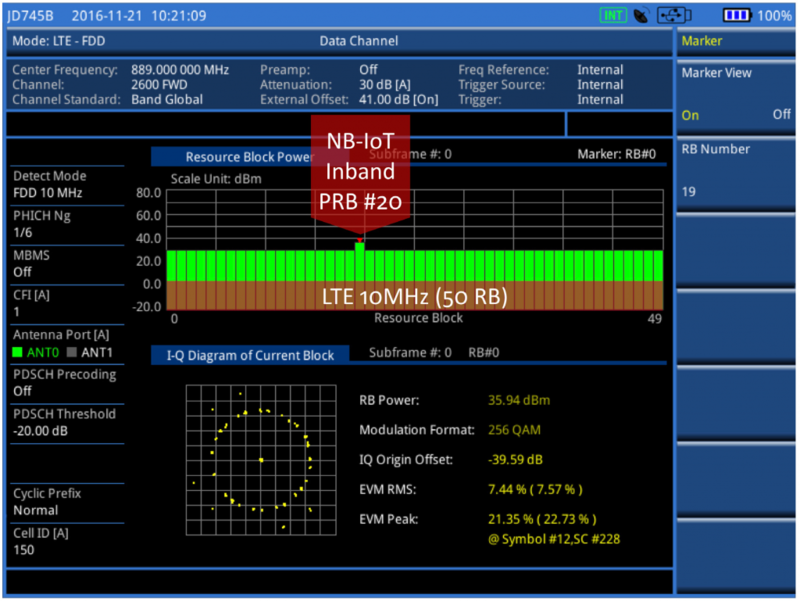 Notwithstanding the above, NB-IoT In-Band also presents an inherent technical challenge: its narrowband signal occupies 180kHz or basically one physical resource block (PRB) within the LTE broadband carrier, which can produce a type of internal interference referred to as Inter-PRB or the interference between two different PRB elements that may collide with each other. 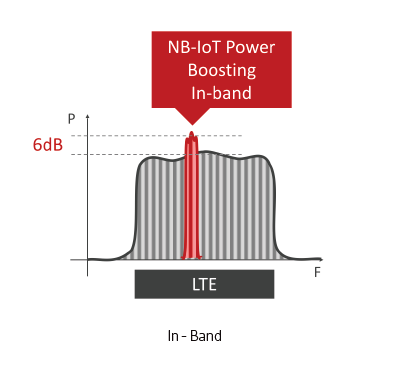 The NB-IoT PRB in In-Band mode differentiates from the other PRBs of the broadband LTE signal using a power dynamic feature (power boosting) that is defined by 3GPP in terms of LTE physical resource block (PRB) to be larger than or equal to +6dB for In-band or for Guard-band operation modes. The 3GPP standard also specifies other NB-IoT signal structure features like supported modulation types, frequency error tolerances or EVM values allowed for the synchronization and control channels. EVM or Error Vector Magnitude is also a measure of the modulation quality and error performance in the transmission or reception channels of complex wireless systems, including LTE and the new NB-IoT signals. EVM is essentially the difference between the ideal transmitted signal and the actual received (measured) one and it gives us a very useful indicator for the quality of the wireless signal transmitted. For new NB-IoT In-Band service activation, inter-PRB interference is a key concern. Verifying inter-PRB interference with an EVM measurement is the most accurate and cost-effective test procedure. By reviewing and validating these metrics during the commissioning stage of a new NB-IoT deployment, and also during regular maintenance checkups, mobile operators can guarantee optimal conditions for their new IoT service, and be assured that it will reach the required objectives in terms of coverage, capacity, and quality of service. VIAVI Solutions has been at the forefront of new NB-IoT network implementations, already supporting renowned wireless operators and NEMs worldwide. To help our customers troubleshoot their early NB-IoT networks, VIAVI has published a comprehensive white paper: NB-IoT: A Practical Guide for Field Testing. For more information about NB-IoT, visit viavisolutions.com/nbiot. Genis Sanchez is a Regional Product Manager for VIAVI Solutions. He initiated his professional career at HP/Agilent Netherlands in 1999 in the digital communications business. In 2001, he transferred to the US to serve as an applications engineer focusing on test solutions for wireless networks, including early 2G technologies (TDMA, CDMA, GSM), later 3G (UMTS, WiMAX), and now 4G LTE / LTE-A. In 2016, he relocated back to Europe, where he focuses on business development, marketing, and regional product management activities for RF Test in the EMEA region.